I have some cool up-and-coming indie polishes for you today by KBShimmer. These will be a part of her fall collection that will be available on September 1st. I'm loving the shades I got to review for you guys. I think you'll like them too! Toucan Touch This is a lemon-lime jelly mixed with varying sizes of gold, green, teal, blue, and orange hex glitters with matching micro bar glitters. 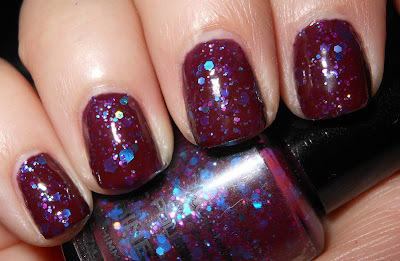 No Whine Left is plum base mixed with varying sizes of blue, fuchsia, and purple glitters. 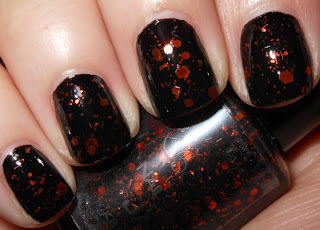 Jack is a black jelly base with varying sizes of orange hex glitters and micro bar orange glitters. 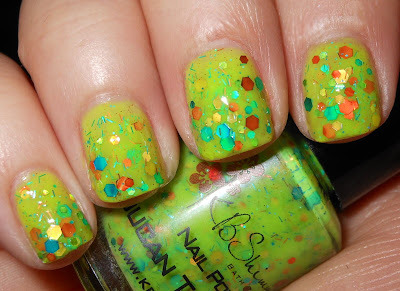 These glitters are very playful, whimsical, and fun. I love how inventive the color combinations are. Toucan Touch This is like no other polish I own. I love the vibrancy of the base and how the colorful glitters pack that extra punch. I like the warm tone of the plum base in No Whine Left and how the bright cool blue of the glitter compliments it. It's really is an unpredictable combination of colors that surprised me. Jack is the perfect color for Halloween. I don't have to worry about what I'm going to be wearing on my nails for Halloween now! I love the varying sizes of glitter in Jack. It gives the polish depth and contrast. Overall, I'm very pleased with these. KBShimmer knows what she's doing! You will be able to purchase these along with the 5 other shades from the fall collection on September 1st on KBShimmer's website. You can find out more information on these polishes and follow updates on KBShimmer on her Facebook page. *These polishes were provided to me for my honest review by KBShimmer. I love these! All of them are gorgeous. My favorite is probably Toucan Touch. It's so much fun and very unique. Toucan Touch This is so pretty, and the name is adorable! Great swatches! Oh, Jack is perfect for fall & Halloween! Very interesting color combinations on those first two colors. Love the last one, Jack, I think I'm going to look for them some time & buy them! I really like Toucan Touch This.